Well, I just finished reading another book. 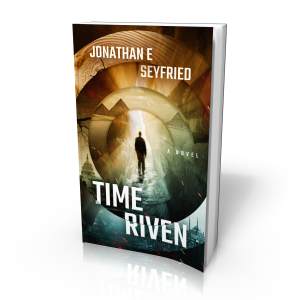 This time it was Time Riven, more of a sci-fi/time travel story. For years, time travel cured disease, freed the innocent, and convicted the guilty. They thought it was safe. In the near future, the science of time travel is developed and regulated by the US government. The safety and benefits of time travel have become taken for granted by the American public. As work begins on the roll-out of private sector time travel, the government agency in charge of its regulation comes under attack. Daniel Macon, Director of Security for the Department of Chronological Integrity, must discover the identity of a rogue chrononaut before time travel is turned against the country. As he pursues his adversary, he discovers that there are dangers in time travel that have been hidden from the public and the nation’s leaders. The Secretary of DCI, his longtime mentor, has deceived him. An agent he once fired for incompetence becomes Daniel’s most trusted ally. A liaison officer from British Intelligence reveals an unimaginable fate for humanity. The inventor of time travel goes into hiding. In the first book of the Time Riven series, the battle lines are drawn. Daniel’s war against the future begins with a brutal attack on his own family. I enjoyed reading this book by Jonathan Seyfried, a history teacher from Santa Fe, New Mexico. And I was glad to find out after I read it, that it is actually the first part of six book series. I was definitely sucked in once I started reading and didn’t want to put the book down. The author did a great job of explaining the time travel technology used in the story, making it easy to understand for those not so scientifically inclined. The story occurs in 2034, and though, of course, things have changed, you find yourself understanding the possibility of what could happen between the present day and that year. Though this is not a genre of book I have read recently, I definitely found myself wanting more, and as I stated previously, happy to know that there will be more to the story of Daniel Macon. If you want to check it out, you can find it here on Amazon.